Suppose I am a Shiva worshipper and I love Lord Shiva, what I do is I place Sri Ramakrishna in my head as my guru [spiritual Preceptor/teacher] and then I take Lord Shiva in my heart. I then take Lord Shiva up to the head and merge Sri Ramakrishna in Lord Shiva. I am still worshipping Shiva. Then I bring Lord Shiva down and make him sit in the heart. I know in Lord Shiva is included that which is called Sri Ramakrishna. This way I do not have any trouble at all. Parambrahma and the guru as Brahma, Vishnu, Mahesh [Shiva] are merged there. Sit down and meditate - nothing excluded, all included. Sri Krishna says he exists eternally, he is the past, present and future. Truth can neither be changed nor taken away at any time. From that point of view, Sri Krishna is not in that untruth, but the untruth is superimposed on Sri Krishna. That which you call ignorance does not exist at all times. It ceases to exist. God never ceases to exist. Maya [the divine power of illusion/delusion] only means: wrong concept - that which is not. And that which is not, is what you are looking at. Though you are looking at it, it is not; it can never ever exist. You are thinking that you are the body, but in reality you are not the body. How then can God be the body? Look at your Real Nature and the body vanishes - you see everything as spirit. It is like the scientist saying, 'Everything is proton and neutron'. But you are saying, 'No, this is a plank [wooden board] and that is flesh'. But the scientist will still say, 'Everything is proton and neutron; everything is energy.' Similarly there is a higher state where the holy man, the Realised Soul, sees everything as Brahman [the One indivisible Consciousness] - which is its real state. That is all. The birth of Sri Ramakrishna has ushered in a new age. The satya yuga [golden age or age of truth] began with Master’s advent. In this yuga people must practise the sattvic quality of truthfulness. From the day that Sri Ramakrishna was born the people of the world began becoming conscious of God. Truth is a sattvic quality, so man will make Sri Ramakrishna a model and will practise spiritual sadhana [practice]. Then their life becomes a blessing. Vedic [of the Vedas – ancient Hindu scriptures] religion is eternal. Not just the books but the knowledge, the principles in the books. That is the eternal religion. It is God’s knowledge. God is eternal and His knowledge is eternal. Sanatana Dharma - the Eternal Religion - encompasses the teachings which are desire-fulfilling; how to realize God and sustain devotion to God; daily prayers etc. What is the highest desire? To realise God. Give up objects and live only for God. 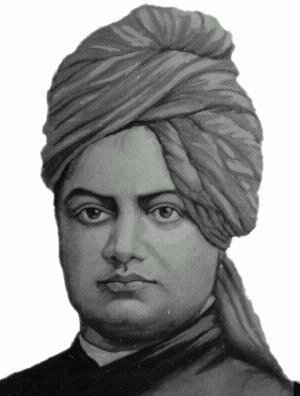 Swami Vivekananda [Sri Ramakrishna's lead disciple - pictured] took science and showed us how the ‘demon’, science, can lead to God. Logical religion is preached. To go beyond logic, to go above secular religion, is knowledge. Swami Vivekananda asked Master, “Have you seen God?” This is not a dull question. But Swami Vivekananda was desperate to find the Truth, and so was Sri Ramakrishna. Everyone thought Sri Ramakrishna was a madman. But when Swami Vivekananda asked the question, “Have you seen God?” Sri Ramakrishna answered, “Yes. And I see God more intensely than I see you.” Later Swami Vivekananda’s heart opened and he realized God. He was a first-class student and he had a first-class teacher in Master. A Master who had found that all religions had Truth in them.